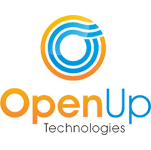 OpenUp Technologies wants to improve the world by making relevant information available in real-time and real-place. Therefore, we want to discover and apply the most innovative technologies and make them accessible. The combination of specific (market) knowledge of traditional enterprises and OpenUp’s digital innovations leads to new propositions and business models. Therefore, OpenUp collaborates with partners who play an important role in their industry, but who also dare to be agile and innovative. That is how we act together in a rapidly changing world. A world where innovative techniques and creative ideas lead to disruptive business models. A world where it is always revolves around one thing. Revealing stories.